De-extinction isn’t a good idea. How de-extinction could derail the conservation movement. So, do advances in molecular biology and cloning offer a glimpse of Jurassic Park-style species revival, and if so, how do we prepare for this? Happily, National Geographic’s just-published cover story on de-extinction offers more context and skepticism than Brand’s TED talk, which means we can address these questions thoughtfully. I want to be as excited about this as I was as an 11-year-old boy watching those dinosaurs on the big screen. And yet, the popularisation of de-extinction as a conservation tool fills me more with trepidation. It’s not that I think the ability to clone animals (extinct or otherwise) from preserved tissue is a bad thing—it’s a very cool development in science. But to call this “de-extinction” would be to frame it as a conservation strategy when it’s really a small, albeit potentially useful, tool. So far, revivification of extinct species has limited success. A single Pyrenean ibex cloned from the last remaining individual suffered a catastrophic birth defect and died within an hour, more Cronenberg than Crichton. But the wonderfully weird gastric brooding frog—which gives birth through its mouth—is alive and kicking again following the work of Australian scientists on University of New South Wales professor Mike Archer’s “Lazarus” project, and it’s likely that more animals will follow in the years ahead. Let’s take a look at one proposed candidates for resurrection: the passenger pigeon. It’s an obvious species for the Revive & Restore project to showcase, given that it is an American bird, it’s instantly familiar, and its reduction from unimaginably large flocks (a single nesting site could boast more than 100 million birds) to complete extinction in the space of a century is a powerful motif for man’s environmental destruction. 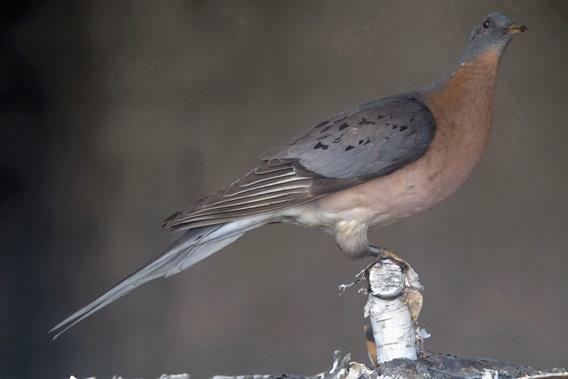 However, the restitution of the passenger pigeon demands many more questions than revivification techniques alone can answer. To start with, those hundred-million-strong flocks were not just abundance, but a survival strategy. Passenger pigeons were probably the most socially gregarious bird in known history. They overwhelmed their predators with sheer numbers. Nothing could kill all of them—well, except humans, who put a big dent in their numbers through hunting and destruction of their nesting sites. Big enough that the system became unstable, and the birds began to die out. Long before the last one was killed, the passenger pigeon was already in terminal decline. As naturalist Paul R. Ehrlich famously wrote, its extinction “illustrates a very important principle of conservation biology: it is not always necessary to kill the last pair of a species to force it to extinction”. Turn that phrase around, and you’ll see that the ability to clone two birds in a lab does not make a species unextinct. Even breeding passenger pigeons in captivity is not a new idea. Attempts during the 20th century failed because the birds will reproduce only in large flocks, where they feel safe. So whoever undertakes this task must bear the heavy burden of knowing they don’t just need to be successful once—they need to be successful thousands of times over. And once you have your menagerie of de-extinct animals, you have to figure out what to do with them. Habitat loss is by and large the greatest driving force for extinction events. Simply put, there aren’t many places left that you can reintroduce large animals without issue. After all, it’s rarely mentioned that the cuddly Jurassic Park billionaire must have committed ecological genocide on a Caribbean island to create his dino fun park. (Who knows how many unique species were wiped out to make way for those dinosaurs?) More prosaically, the reintroduction of gray wolves into Yellowstone was defined by decades-long battles between ecologists and ranchers. In some cases, resistance came from the great-grandchildren of the same ranchers who’d helped eradicate the wolves in the first place. Unless we can resolve the issues that drove animals to extinction before, reintroduction attempts will be no better than Jurassic Park—open-air theme parks constructed and maintained by humans for our own enjoyment (and maybe with a bit less carnage). But perhaps most importantly, to focus on de-extinction as a conservation strategy communicates the idea that species loss defines environmental degradation, rather than exists as a symptom of it. The accumulated pressures that drive animals to extinction are characterized by the continued expansion of humans into their environment. We can’t demand people stop doing this any more than we can demand New York City be returned to nature. So for me, conservation will always be defined by the careful balancing of human and animal demands upon the environment, rather than the re-creation of wilderness areas that a term like de-extinction suggests. Before we start bringing animals back from the dead, we need to make sure there’s space in the world for them. It’s essential that the ecological architects of de-extinction design an environment that will survive the future, rather than simply re-creating the past.